Cover of the first volume featuring Yumina (left), Touya (middle), and Sushie (right). 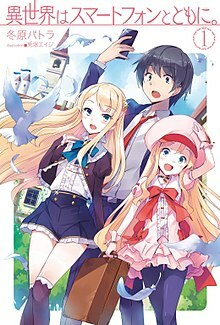 In Another World with My Smartphone (異世界はスマートフォンとともに, Isekai wa Sumātofon to Tomo ni) is a Japanese light novel series written by Patora Fuyuhara and illustrated by Eiji Usatsuka. It began serialization online in 2013 on the user-generated novel publishing website Shōsetsuka ni Narō until it was acquired by Hobby Japan for publishing the print edition as a Light Novel. J-Novel Club has licensed the series for an English release, releasing each novel in six weekly parts since February 2017. A manga adaptation by Soto began its serialization in Kadokawa Shoten's Comp Ace in November 2016. An anime television series adaptation by Production Reed aired from July to September 2017. The series has been licensed by Crunchyroll. Fifteen-year-old Touya Mochizuki is accidentally killed by God. As an apology, God allows him to be resurrected, but since he cannot send him back to his old world, he instead reincarnates him into a fantasy world along with a single special request. Touya uses his request in order to bring his smartphone into the new world with him, which God modifies so that the phone will function in the new world. God also greatly amplifies Touya's physical, magical, and cognitive abilities to a certain degree as a further apology for the inconvenience of killing him. Taking full advantage of his second chance at life, Touya befriends many different people, mainly females and high-ranking people in the new world. He begins to travel from country to country, solving political disputes, minor quests, and nonchalantly enjoying himself with his newfound allies. A fifteen-year-old from Earth, reborn by God into the other world as a way of apology for the latter's mistake of killing him. His smartphone is his only remaining connection to Earth; while he can no longer call upon anyone from his old life, he can still access the Internet, and the battery can be recharged with magical energy. He is bestowed with all seven attributes of magic: Fire, Water, Wind, Earth, Light, Dark, and Null. He regularly gets mistaken to be from Eashen, a country resembling Feudal Japan, sharing the same back-to-front naming system. He begins as a simple adventurer in the Kingdom of Belfast, though due to his granted skills and humble nature he quickly rises in fame through impulsive acts. After discovering the first Babylon "Aerial Garden" and having a mock conversation with Professor Regina Babylon, he sets out to find the rest of the Babylons in order to defeat the Phrase. According to Babylon's vision, Touya would have nine wives in total. He gradually forms pacts with all four of the Heavenly Beasts, with the first and most loyal being Kohaku, the White Monarch. He also eventually becomes king of the Brunhild Dukedom after helping to smooth out relations between the Regulus Empire and Belfast Kingdom. He is also the first silver rank adventurer to appear in 18 years, and later, upon achieving gold rank, becomes one of only two living "heroes" in the world. Later on, he is a demi-god on his way to becoming a full god. Due to his body being rebuild in the divine realm by the God of Worlds. Born in the far eastern country of Eashen to a samurai family, Yae left her home to travel and hone her skills elsewhere. Touya's group crosses paths with her during their travels, helping to fend off a group of ruffians attacking her. Thereafter, she decides to accompany Touya on his travels. Eventually she returns to Eashen alongside his group to save her father, brother, and hometown from a provincial war within the country. Throughout these events, she falls in love with Touya. In the end, she and Elze fight Touya in a mock battle and win, requesting to become his fiancées as their prize. She is Touya's fourth fiancée. Daughter of the Duke Alfred Urnes Ortlinde, and Yumina's cousin. Sushie prefers for her friends to call her Sue (スゥ, Sū). She meets Touya's group early in the story when they rescue her from an attempted kidnapping, leading to her forming a crush on Touya. She also introduces Touya to her father, talking how her mother been cursed of blindness, wishing her grandfather who was a user of Null magic was still alive for cure. By sharp coincidence, Touya cures Sue's mother's eye illness, earning great honor in the Kingdom of Belfast. Later, to protect Sue from a political betrothal to a foreign prince suspected of pedophilia, she becomes Touya's sixth fiancée. A Princess of Belfast, and daughter of King Tristwin and Queen Yuel. Yumina met Touya when he heals her father from an attempted poisoning. Yumina possess the Null magic "Mystic Eyes", an ability that comes from her Heterochromic Eyes which give her the ability to see a person's true nature. Due to this power, upon seeing the selfless and kind aura surrounding Touya after he saves her father, she asks to be engaged to him, believing that she will never find a better candidate to be her husband. She is also proficient with bows and arrows, often choosing to fight alongside a pack of hunting wolves summoned with her darkness attribute. Later, when Touya becomes king of the Brunhild Dukedom, Yumina forms the Bride Conference, a group made up of Touya's fiancées who meet, discuss, and judge any additional women who fall for him to determine if they should become an official fiancée since polygamy is standard in her world. She is Touya's first fiancée. As head of the Fairy Tribe of Mismede, Leen serves as the court mage of the Kingdom of Mismede and is capable of using her personal null magic, 'Program'. Over the span of 200 years, she has used 'Program' to create an automated teddy bear named Paula who can to interact with humans, though it has yet to gain the capability to speak. She meets Touya during a diplomatic trip from Belfast, when Paula brings him to her personal chambers. Intrigued by his abilities, she asks him to become her disciple; when Touya declines; she becomes Mismede's ambassador to Belfast as an excuse to spend more time around him. She is the one to start Touya on the quest for finding the ancient pieces of the lost civilization of Babylon, as she wants to gain knowledge from the "Library" Babylon. Eventually, upon Touya's discovery of the library, she asks him to marry her. Leen becomes Touya's eighth fiancée. The third princess of the Regulus Empire. Touya meets Lucia when he saved the empire from being overthrown by the imperial army in a coup. He agrees to marry her after the Emperor of Regulus creates a truce with the King of Belfast, then she moves into the Brunhild Dukedom with Touya and everyone else. Lucia is a competitive person who hates losing. Her main weapon is a twin sword. She is also diligent at cooking, and has a sensitive taste bud. Lucia is Touya's fifth fiancée. Hildegard is the first princess of Lestia Knight Kingdom. She is rather chivalrous noble person and usually wears a magic-enchanted armor. She is on good terms with Yae, as the two are quite skilled in swordsmanship, and is known as "Knight Princess". Hildegard fell in love with Touya after the battle with the Phrase. Then she moves in the Brunhild Dukedom with Touya. She is Touya's seventh fiancée. She is actually a potential successor of Xenoas Demon Kingdom. However, due to being demi-human she is considered an outcast to others, regardless of her highest magic quality to take the throne. One day, she survived an assassination attempt and escape with her Null magic: Teleport. After being rescued by Touya and regenerate her lost limbs, she suffered amnesia and being named as 'Sakura' by Touya for her pink hair. Her real name is Farnese Forneus. Prior the series, she was bestowed with Phantom of Eyes which altered her face and changed her hair color, with sharp hearing ability. Currently, she stays with Touya at Brunhild Dukedom. She becomes Touya's ninth fiancée. The series began publication as a web novel, being serialized on the Shōsetsuka ni Narō website since April 8, 2013. The series was later published as a light novel series by Hobby Japan's "HJ Novels" label beginning on May 22, 2015; fifteen volumes have been published as of December 22, 2018. The light novel features illustrations by Eiji Usatsuka. It was licensed for digital distribution in the English language by J-Novel Club. J-Novel Club announced at Anime Expo on July 5, 2018 that the series would be the first it would publish in print outside its deal with Seven Seas Entertainment. The novels is published in a partnership with Ingram Publisher Services. A manga adaptation by Soto began serialization in the January 2017 issue of Comp Ace (published November 2016), with the first two compiled tankōbon volumes released consecutively in June and July 2017 and the third volume in February 2018. An anime television series adaptation directed by Takeyuki Yanase, written by Natsuko Takahashi, and animated by Production Reed was announced and aired from July 11 to September 26, 2017. AŌP performed the opening theme song "Another World" while Maaya Uchida, Yui Fukuo, Chinatsu Akatsuki, Marika Kouno, Nanami Yamashita, and Sumire Uesaka performed different versions of the ending theme song "Junjō Emotional" (純情エモーショナル, Pure Emotional). Crunchyroll streamed and licensed the series, while Funimation produced an English dub and released it on home video as part of the two companies' partnership. Funimation released the series for home video in the British Isles, and in Australia and New Zealand, through their distributors at Sony Pictures UK and Universal Sony respectively. The series has seen considerable popularity on the Shōsetsuka ni Narō website, having been viewed over 100,000,000 times in total. ^ a b "Harem Light Novel "Isekai wa Smartphone to Tomoni." Gets TV Anime Adaptation This Summer". Crunchyroll. March 21, 2017. Retrieved January 27, 2019. ^ a b c "コンプエース 2017年1月号". コンプエース. Kadokawa Corporation. Retrieved January 24, 2018. ^ a b c "コンプエース 2017年1月号". Amazon Japan. Retrieved January 24, 2018. ^ a b c d e f g h i "In Another World with My Smartphone Anime Reveals Cast, Theme Song Artists, July 11 Debut". Anime News Network. May 23, 2017. Retrieved May 23, 2017. ^ a b c d e f "Summer 2017 SimulDubs on FunimationNow!". Funimation. July 13, 2017. Retrieved March 6, 2019. ^ "That's me tormenting @JoshGrelle yet again". Twitter.com. September 18, 2017. ^ "異世界はスマートフォンとともに。". ncode.syosetu.com (in Japanese). Retrieved March 6, 2019. ^ "J-Novel Club Licenses In Another World with My Smartphone Novel". Anime News Network. Retrieved March 6, 2019. ^ Ressler, Karen (July 5, 2018). "J-Novel Club Announces Print Publishing Line With In Another World with My Smartphone Novels". Anime News Network. Retrieved July 5, 2018. ^ "異世界はスマートフォンとともに。１". HJ Novels (in Japanese). Hobby Japan. Retrieved July 11, 2017. ^ "In Another World with My Smartphone: Volume 1". J-Novel Club. Retrieved January 19, 2018. ^ "異世界はスマートフォンとともに。2". HJ Novels (in Japanese). Hobby Japan. Retrieved July 11, 2017. ^ "In Another World with My Smartphone: Volume 2". J-Novel Club. Retrieved January 19, 2018. ^ "異世界はスマートフォンとともに。3". HJ Novels (in Japanese). Hobby Japan. Retrieved July 11, 2017. ^ "In Another World with My Smartphone: Volume 3". J-Novel Club. Retrieved January 19, 2018. ^ "異世界はスマートフォンとともに。4". HJ Novels (in Japanese). Hobby Japan. Retrieved July 11, 2017. ^ "In Another World with My Smartphone: Volume 4". J-Novel Club. Retrieved January 19, 2018. ^ "異世界はスマートフォンとともに。5". HJ Novels (in Japanese). Hobby Japan. Retrieved July 11, 2017. ^ "In Another World with My Smartphone: Volume 5". J-Novel Club. Retrieved January 19, 2018. ^ "異世界はスマートフォンとともに。6". HJ Novels (in Japanese). Hobby Japan. Retrieved July 11, 2017. ^ "In Another World with My Smartphone: Volume 6". J-Novel Club. Retrieved January 19, 2018. ^ "異世界はスマートフォンとともに。7". HJ Novels (in Japanese). Hobby Japan. Retrieved July 11, 2017. ^ "In Another World with My Smartphone: Volume 7". J-Novel Club. Retrieved January 19, 2018. ^ "異世界はスマートフォンとともに。8". HJ Novels (in Japanese). Hobby Japan. Retrieved July 11, 2017. ^ "In Another World with My Smartphone: Volume 8". J-Novel Club. Retrieved August 30, 2018. ^ "異世界はスマートフォンとともに。9". HJ Novels (in Japanese). Hobby Japan. Retrieved August 7, 2017. ^ "In Another World with My Smartphone: Volume 9". J-Novel Club. Retrieved August 30, 2018. ^ "異世界はスマートフォンとともに。 10". HJ Novels (in Japanese). Hobby Japan. Retrieved September 27, 2017. ^ "In Another World with My Smartphone: Volume 10". J-Novel Club. Retrieved August 30, 2018. ^ "異世界はスマートフォンとともに。 11". HJ Novels (in Japanese). Hobby Japan. Retrieved April 4, 2018. ^ "In Another World with My Smartphone: Volume 11". J-Novel Club. Retrieved January 1, 2019. ^ "異世界はスマートフォンとともに。 12". HJ Novels (in Japanese). Hobby Japan. Retrieved April 4, 2018. ^ "In Another World with My Smartphone: Volume 12". J-Novel Club. Retrieved January 1, 2019. ^ "異世界はスマートフォンとともに。 13". HJ Novels (in Japanese). Hobby Japan. Retrieved January 1, 2019. ^ "In Another World with My Smartphone: Volume 13". J-Novel Club. Retrieved February 17, 2019. ^ "異世界はスマートフォンとともに。 14". HJ Novels (in Japanese). Hobby Japan. Retrieved January 1, 2019. ^ "In Another World with My Smartphone: Volume 14". J-Novel Club. Retrieved March 31, 2019. ^ "異世界はスマートフォンとともに。 15". HJ Novels (in Japanese). Hobby Japan. Retrieved January 1, 2019. ^ "異世界はスマートフォンとともに。 16". HJ Novels (in Japanese). Hobby Japan. Retrieved March 13, 2019. ^ "異世界はスマートフォンとともに。 16 ドラマCD付き特装版". HJ Novels (in Japanese). Hobby Japan. Retrieved April 8, 2019. ^ a b "異世界はスマートフォンとともに。(1)". KADOKAWAオフィシャルサイト. Kadokawa Corporation. Retrieved January 24, 2018. ^ a b "異世界はスマートフォンとともに。(2)". KADOKAWAオフィシャルサイト. Kadokawa Corporation. Retrieved January 24, 2018. ^ a b "異世界はスマートフォンとともに。(3)". KADOKAWAオフィシャルサイト. Kadokawa Corporation. Retrieved January 24, 2018. ^ "異世界はスマートフォンとともに。(4)". KADOKAWAオフィシャルサイト. Kadokawa Corporation. Retrieved January 1, 2019. ^ "異世界はスマートフォンとともに。(5)". KADOKAWAオフィシャルサイト. Kadokawa Corporation. Retrieved January 1, 2019. ^ "異世界はスマートフォンとともに。(6)". KADOKAWAオフィシャルサイト. Kadokawa Corporation. Retrieved April 8, 2019. ^ "In Another World with My Smartphone Light Novels Get Summer TV Anime". Anime News Network. March 21, 2017. Retrieved March 21, 2017. ^ "Crunchyroll to Stream New Game!! Season 2, In Another World with My Smartphone Anime". Anime News Network. July 11, 2017. Retrieved July 11, 2017. ^ "Funimation to Stream Simuldub for In Another World With My Smartphone Anime". Anime News Network. July 18, 2017. Retrieved February 17, 2019. ^ "Crunchyroll and Funimation Reveal New Slate of Home Video Releases". Crunchyroll. April 19, 2018. Retrieved April 19, 2018. ^ "In Another World with My Smartphone listed for UK home video release this October, Drifters also listed". Anime UK News. August 6, 2018. Retrieved August 7, 2018.